I am thrilled to announce that the SEALFIT flag is now flying at the North Pole. Geordie Young, Kokoro 29 graduate and long-time Unbeatable Mind student, humped the SEALFIT Flag to the Pole two weeks ago to stake his claim. The expedition included wounded warriors from the Canadian military, notable Olympic athletes and executive sponsors. “Coach Divine – Just wanted to let you know that I am back from a successful expedition that reached the Pole. All 53 members of the team achieved the target. There was a wide disparity of ages and athletic abilities present and we all pulled together to get it done. I wanted to thank you again for your generous sponsorship of UMA memberships for all the participants. I had many conversations with other team members who had spent some time working through the material, mainly the ex-soldiers. These wounded veterans are struggling to re-establish themselves in civilian society, and I know that for many of them, UMA has been very helpful. 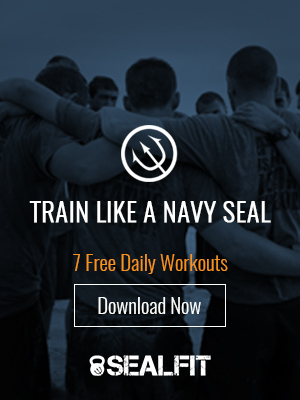 I did my best to communicate through my words and my actions the principles of SEALFIT / UMA. I will follow up with some great pictures, including some good shots of the SEALFIT flag flying proudly at the North Pole. But now I want to share one event with you. It was our fourth day of skiing…and for the first time we were going overland as we had to cross from the sea ice over a peninsula back to the sea ice on the other side. On this particular morning, in addition to my gear, I had also picked up three personal gear bags from other people, plus our section’s tent, most of our section’s fuel and most of the remaining section food. Needless to say my sled was weighed down. And I knew the terrain was going to be tougher than the flat of the sea ice. The previous day I had picked up a second sled to drag when one of the team members struggled with it. So I went across the camp that morning and offered to take the second sled again. Between the two sleds and all the extra gear, I had a pretty decent load. This is where I went through the UMA checklist. First I created a “strong why,” a reason why I wasn’t going to let this load beat me. Then I closed all the doors to eliminate the quit option. I made it clear to myself, and anyone who asked, that I was GOING to get this load to the other side – no matter what. In my mind I made it clear that people were going to have to fight me to get the load off my hands. Can I hear a resounding Hooyah for Geordie and his team?